First, welcome to our community forum easthamaw And second thank you for purchasing our kit! I love mine to death! Easiest solution would be to put a floor jack under your crossmember, detatch it from your frame, and then lower the transmission down about an inch or so. It doesn't need to be lowered much. Wouldn't need to disconnect anything else. Then jack it back up when done. What year truck? What point socket? Will Marlin ever build a short throw for the 2005+ Tacoma? How about the forward shift w56/t-case combo? Should I wait for it or are guys not dealing the 2005+ trucks? I'd rather not get another brand but this 2005 shifter is sloppy. Sloppy could just be the shifter base ring thingie. What I meant was the throw on the 05 shifter is huge. My shifter, when in gear doesn't have play. Maybe I just need to get used to it but I lose a lot of speed/RPMs/momentum when the distance between gears is so far. Very different than my 2000. Even before my Marlin short throw. We already have a few stock RA60's here. I'll wait for yours rather than some one elses guaranteed. 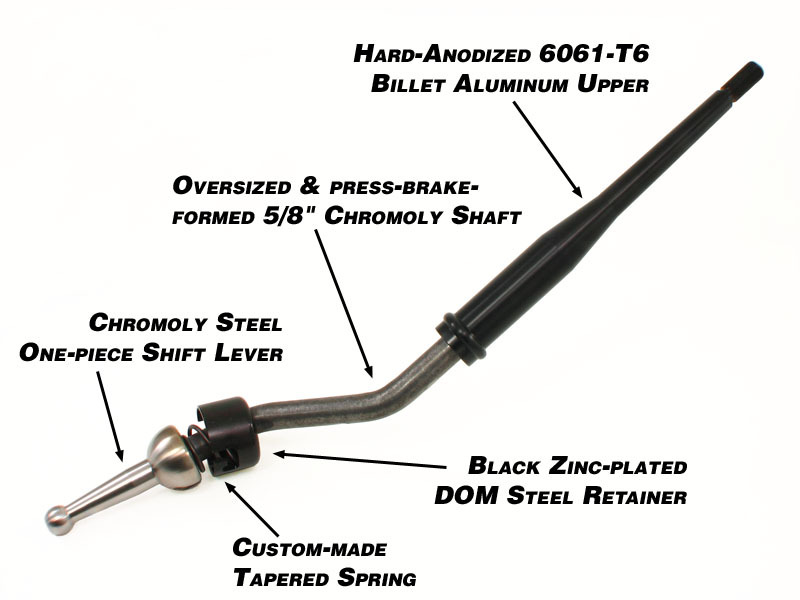 GREAT News: We are now manufacturing our own High Quality Shift Handle! The most beneficial part about this for us is that we no longer have to run to the wrecking yard over and over to find additional shift handles to modify. Despite the old $100 core charge, only 12% of customers would return their handles for the core refund (the core charge was not high enough!). Without cores coming back, we run out of stock Toyota handles and it would usually be Marlin searching wrecking yards on weekends for more. What's worse is some core returns would be beyond repair and junked. As you can see we have wanted to do this for a long time and are EXCITED to finally offer a COMPLETE all-new kit for the first time in our history of building short throws circa 1996! W-series handles are nearly finished and will be released very soon! Hey Mike, what's the diff between w56a & b? What ovrarok said. Same thing. Glad to see this happen mike! Keep up the good work! Any luck on w59 bases yet? Where's my RA60F short throw? I kept a couple parts of the shifters wrapped up so that I don't get dirt on em..
Also, these CNC shift knobs are great! Can't wait to get my tcase knob! If this post is unwanted or misplaced, my apologies. Feel free to move it or delete it if it's inappropriate for this thread. Only problem now is the stock shifter boot... It doesn't fit anymore because the shifters are running in different directions than stock... Now the transmission shifter runs back and to the right, and the t case shifter runs up and to the left... Any help? Flip both levers around 180-degrees? Only thing I can think is that now I need a "G" series transmission boot, or I'l just have to cut mine and fab something up... I don't mind fabbing something up if needed, but I figured I'd ask to see what you guys have done in the past... How did Mitch do his?